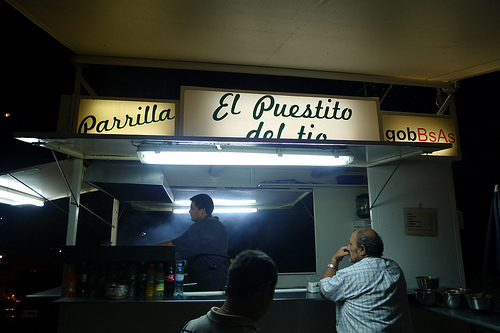 One of my fondest childhood food memories is eating a choripan (“chori”zo in a “pan” (bread) makes a chorizo sandwich) on the streets of Costanera. 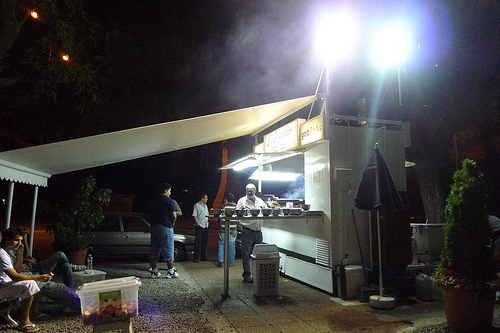 These Buenos Aires road-side parrilla (BBQ) stands also known as Los Carritos de la Costanera offer a mean Argentinean Chorizo (usually pork, sometimes beef), grilled on the spot and cut open in half known as “mariposa” or butterfly style. Each stand has their own special sauce, usually consists of an chimichurri, provensal (parsley garlic) and a salsa criolla (onions, tomatoes and peppers). This time around, my God brother decided to take me to their new usual late night eat, El Puestito del Tio (not in Costanera, but in Dorego) we purposely ate an early dinner so I could squeeze this in. 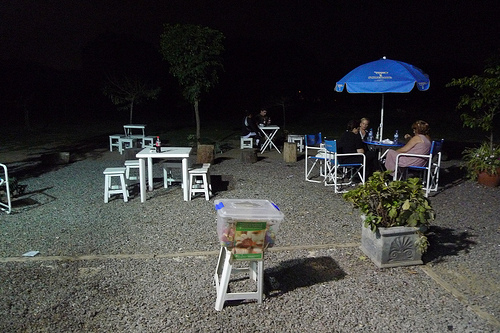 A bbq stand by the park. Low key and very sketchy, but the smell of meats sizzling on fire made me salivate like a teething baby. No gloves? No problem. I mean when it comes to street food, my hygiene standards go down hill… way down hill. My God brother says, he sometimes sees the cook go to the bathroom and NOT wash his hands. Definitely TMI! 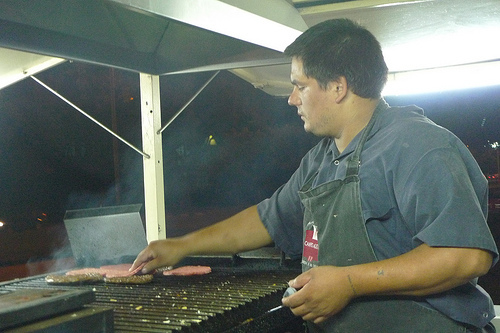 But nothing was going to stop me, after 10 years, I wanted my choripan and I didn’t care. So I just pretended like the health inspectors gave them a thumbs up and Mr. Clean himself payed them a visit. 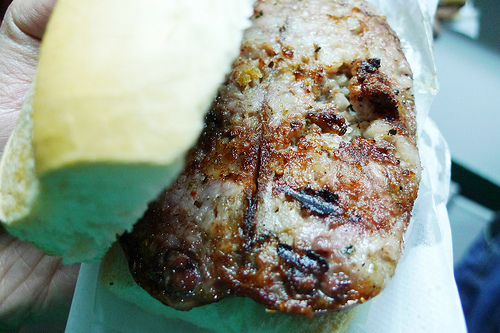 After a couple minutes, the nicely grilled choripan was in my hands at last. Nicely chard on a warm crusty bread. Best part about this place is the row of sauces. 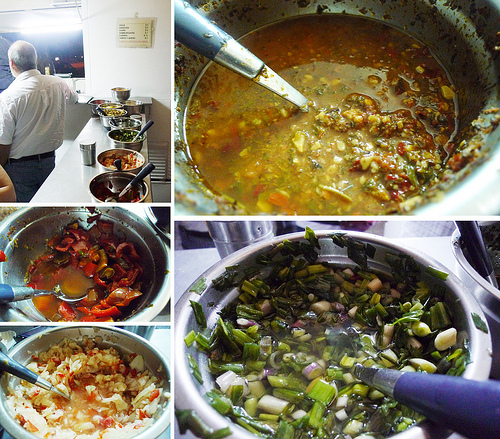 Everything from your typical chimichurri, provensal and criolla to scallions and garlic, roasted peppers, sweet and sour cabbage. I topped my choripan the only way I knew… a little bit of everything for my indecisive tummy. It’s smokey, garlicky, meaty, spicy and soooooo reminiscent of my childhood. 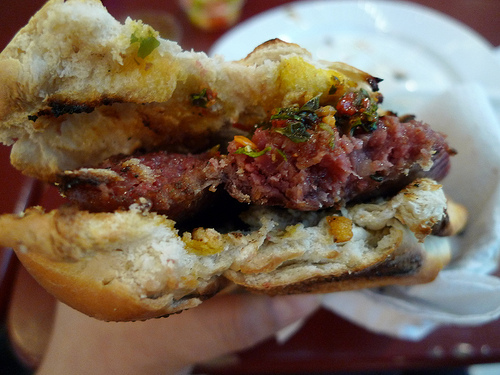 The chorizo however, is a little on the greasy side, less meat and more chunks of fat. I’m never one to turn down fat, so I ain’t complain. But leaner would of been better, actually a lot better. According to my friends, they make an outstanding burger, I guess I’ll just have to go back and taste for myself. For a better quality choripan (chorizo as you can see has almost no fat) my other friends took me to Paseo Alcorta mall’s food court on the 3rd fl. This is the mall I use to walk to Costanera from, back in the day. This choripan was about 3-4 times the price of the street ones, but I’m ok with paying for good ingredients. Argentinean Chorizo just tastes better, maybe because we have better meat, or just because it’s the taste I’m accustomed to. 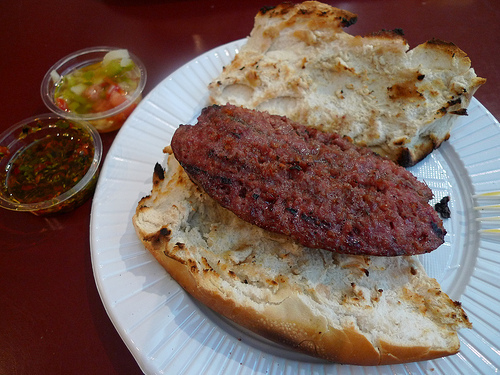 Either way, this was really good choripan. I can see why my friend prefers this place. 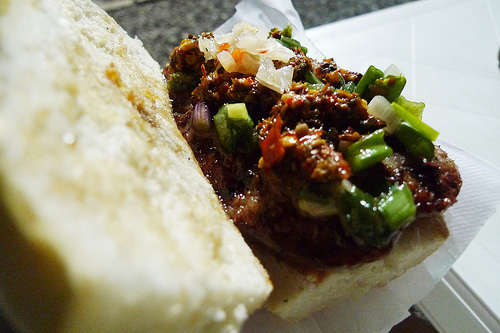 But as tasty as this was, there was something missing… it isn’t a real choripan experience. In order to feel authentic, it has to be sketchy, in the dark and by the side of the road, at least in my book. I want to be there right now with you! Gosh, it would be awesome to follow you around while you ate exciting things. Sue would you eat EVERYTHING i eat?